Millwood Lake, in southwestern Arkansas, was constructed and is operated by the U.S. Army Corps of Engineers (USACE) for flood-risk reduction, water supply, and recreation. The lake was completed in 1966 and it is likely that with time sedimentation has resulted in the reduction of storage capacity of the lake. The loss of storage capacity can cause less water to be available for water supply, and lessens the ability of the lake to mitigate flooding. Excessive sediment accumulation also can cause a reduction in aquatic habitat in some areas of the lake. Although many lakes operated by the USACE have periodic bathymetric and sediment surveys, none have been completed for Millwood Lake. In March 2013, the U.S. Geological Survey (USGS), in cooperation with the USACE, surveyed the bathymetry of Millwood Lake to prepare an updated bathymetric map and area/capacity table. The USGS also collected sediment thickness data in June 2013 to estimate the volume of sediment accumulated in the lake. 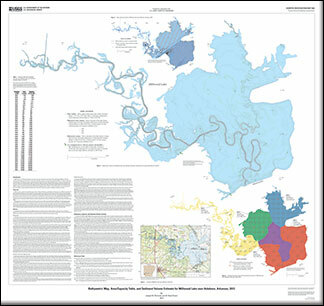 Richards, J.M., and Green, W.R., 2013, Bathymetric map, area/capacity table, and sediment volume estimate for Millwood Lake near Ashdown, Arkansas, 2013: U.S. Geological Survey Scientific Investigations Map 3282, 1 sheet, https://dx.doi.org/10.3133/sim3282.